Xxara is happy-go-lucky, always hungry and loves to play. No, we’re not talking playmate of the year … although in some circles she certainly would be considered. Xxara is an explosives scent dog who works the Metro beat for the L.A. County Sheriff’s Department Canine Services Detail. 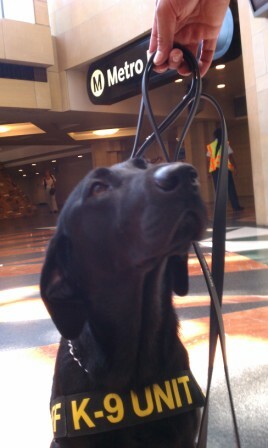 It’s her job to search for explosives on Metro buses, trains and property. Or it will be, when she is fully trained. Currently the two-year-old black Lab retriever is acclimating to the kind of life she didn’t know at the TSA (Transportation Security Administration) training center at Lackland Air Force Base in Texas. In Texas she was not taught about skateboards, moving trains and escalators. There weren’t any. She had never known — and so worries about — sprinklers. But these are concepts she is learning to understand. What she does know well, since she was expertly schooled, is what explosives smell like (her training), how to search for them (her nose) and what to do if she finds one (alert her handler). Xxara is the newest member of Metro’s elite 13-dog Canine Services Detail. It’s her job to keep us safe, as well as to play and roll around and lick the hands that pet her. And there are plenty. 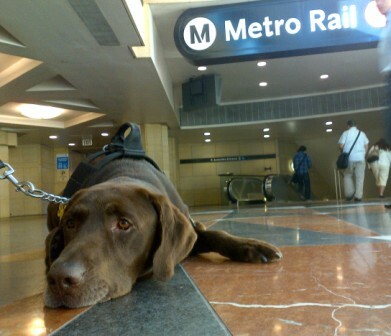 The dogs who work at Metro — including Wilson, a five-year-old chocolate Lab — are perhaps as well known for their charm as for their prowess, making them a popular and reassuring presence along the rail lines and in the buses. How do you train a dog to search out and find explosives? So the talent is inherent. But at TSA training in Texas the dogs are tested to find those best for the job: best sniffers, best temperaments. They learn to identify a variety of explosives, to follow orders and to stay focused on the task at hand. And then they are paired with L.A. County Sheriffs who travel to Texas for 10 weeks to work with the dogs and to learn to recognize explosives when the dogs “alert” to them. (The deputies also take a series of written tests.) Even after leaving, each team must successfully complete annual certification testing. The dogs may be able to find a bomb but securing the surrounding area and calling in for support are not in their job description. Neither the Sheriffs nor the dogs are required to detonate or defuse bombs. That’s the responsibility of highly trained bomb techs. The Texas lessons are similar to the way most of us train our pets, except that the reward is not a dog treat but the opportunity to play with a favorite rubber toy called a Kong. It’s not practical for Xxara and Wilson to perform for food because in some situations their important work could be affected by the distraction. A dog checking an area or a backpack for explosives doesn’t have time to be distracted by a discarded cheeseburger. Instead the dogs are trained that once they find an explosive, they will get time to play with their Kong toy. So for them, the search for explosives is really an effort to reach play time. Is it so different for humans? Xxara and Wilson and the other dogs assigned to Metro are each teamed and trained with an L.A. County Sheriff who will remain their partner throughout the life of their work — generally 7 years. The dogs live with their handlers. The federal TSA canine training program — commonly referred to as the Puppy Program — began in 1999 and was expanded after 9/11. It trains dogs to protect U.S. airports and mass transit systems. The first dog came to Los Angeles in 2004. And now there are German shepherds, Malinois (Malawas) and Labrador retrievers, like Xxara and Wilson. And the name Xxara? The dogs are named in Texas by the TSA team. If the name has a double letter at the beginning, it’s the name of a fallen soldier or a victim of 9/11. I think you mean Lackland Air Force Base, not Lakeland. Having worked and trained both dogs and handlers, I don’t believe the readers need to know all that is involved int the process. But, you are right, it is a long process. I have read elsewhere that the Canines’ olfactory (neural connections) are on the order of 185 – 215 million. Where we humans top-out at ~15 million. General Petraeus himself stated something to the effect that: “By any measure, these dogs outperform any asset in our inventory”.